Now that we’ve broken down the basics of our template, let’s start adding some meat to the bones and give our page some structure. Later in the book, we’re going to specifically deal with adding CSS3 features and other HTML5 goodness; for now, we’ll consider what elements we want to use in building our site’s overall layout. We’ll be covering a lot in this section and throughout the coming chapters about semantics. When we use the term “semantics,” we’re referring to the way a given HTML element describes the meaning of its content. Before we decide which elements are appropriate for these different parts of our page, let’s consider some of our options. First of all, we’ll introduce you to some of the new HTML5 semantic elements that could be used to help divide our page and add more meaning to our document’s structure. Contrary to what you might normally assume, you can include a new header element to introduce each section of your content. It’s not just reserved for the page header (which you might normally mark up with <div id="header">). When we use the word “section” here, we’re not limiting ourselves to the actual section element described in the next part; technically, we’re referring to what HTML5 calls “sectioning content.” This means any chunk of content that might need its own header, even if that means there are multiple such chunks on a single page. A header element can be used to include introductory content or navigational aids that are specific to any single section of a page, or apply to the entire page, or both. While a header element will frequently be placed at the top of a page or section, its definition is independent from its position. Your site’s layout might call for the title of an article or blog post to be off to the left, right, or even below the content; regardless of which, you can still use header to describe this content. It further explains that a section shouldn’t be used as a generic container that exists for styling or scripting purposes only. If you’re unable to use section as a generic container—for example, in order to achieve your desired CSS layout—then what should you use? Our old friend, the div element, which is semantically meaningless. Going back to the definition from the spec, the section element’s content should be “thematic,” so it would be incorrect to use it in a generic way to wrap unrelated pieces of content. Every time new semantic markup is made available to web designers, there will be debate over what constitutes correct use of these elements, what the spec’s intention was, and so on. You may remember discussions about the appropriate use of the dl element in previous HTML specifications. Unsurprisingly, HTML5 has not been immune to this phenomenon, particularly when it comes to the section element. Even Bruce Lawson, a well-respected authority on HTML5, has admitted to using section incorrectly in the past. For a bit of clarity, it’s well worth reading Bruce’s post explaining his error. section is generic, so if a more specific semantic element is appropriate (such as article, aside, or nav), use that instead. section has semantic meaning; it implies that the content it contains is related in some way. If you’re unable to succinctly describe all the content you’re trying to put in a section using just a few words, it’s likely you need a semantically neutral container instead: the humble div. That said, as is always the case with semantics, it’s open to interpretation in some instances. If you feel you can make a case for why you’re using a given element rather than another, go for it. In the unlikely event that anyone ever calls you on it, the resulting discussion can be both entertaining and enriching for everyone involved, and might even contribute to the wider community’s understanding of the specification. Keep in mind, also, that you’re permitted to nest section elements inside existing section elements, if it’s appropriate. For example, for an online news website, the World News section might be further subdivided into a section for each major global region. The article element represents a complete, or self-contained, composition in a document, page, application, or site and that is, in principle, independently distributable or reusable, e.g. in syndication. The key terms in that definition are self-contained composition and independently distributable. Whereas a section can contain any content that can be grouped thematically, an article must be a single piece of content that can stand on its own. This distinction can be hard to wrap your head around, so when in doubt, try the test of syndication: if a piece of content can be republished on another site without being modified, or if it can be pushed out as an update via RSS, or on social media sites such as Twitter or Facebook, it has the makings of an article. Finally, just like section elements, article elements can be nested inside other article elements. You can also nest a section inside an article, and vice versa. It all depends on the content you’re marking up. It’s safe to assume that the nav element will appear in virtually every project. nav represents exactly what it implies: a group of navigation links. Although the most common use for nav will be for wrapping an unordered list of links, there are other options. For example, you could wrap the nav element around a paragraph of text that contained the major navigation links for a page or section of a page. In either case, the nav element should be reserved for navigation that is of primary importance. So, it’s recommended that you avoid using nav for a brief list of links in a footer, for example. Although not all assistive devices recognize nav as of this writing, by building to the standards now you ensure that as screen readers improve, your page will become more accessible over time. You’ll encounter the term “user agent” a lot when browsing through specifications. Really, it’s just a fancy term for a browser—a software “agent” that a user employs to access the content of a page. The reason the specs don’t simply say “browser” is that user agents can include screen readers or any other technological means to read a web page. You can use nav more than once on a given page. If you have a primary navigation bar for the site, this would call for a nav element. Additionally, if you had a secondary set of links pointing to different parts of the current page (using in-page anchors or “local” links), this too could be wrapped in a nav element. As with section, there’s been some debate over what constitutes acceptable use of nav and why it isn’t recommended in some circumstances (such as in a footer). Some developers believe this element is appropriate for pagination or breadcrumb links, or for a search form that constitutes a primary means of navigating a site (as is the case on Google). This decision will ultimately be up to you, the developer. Ian Hickson, the primary editor of WHATWG’s HTML5 specification, responded to the question directly: “use [it] whenever you would have used class=nav”. a specific standalone piece of content (such as an article or section). an entire page or document, as is customarily done when adding a sidebar to a page or website. The aside element should never be used to wrap sections of the page that are part of the primary content; in other words, aside is not meant to be parenthetical. The aside content could stand on its own, but it should still be part of a larger whole. Some possible uses for aside include a sidebar, a secondary list of links, or a block of advertising. It should also be noted that the aside element (as in the case of header) is not defined by its position on the page. It could be on the side, or it could be elsewhere. It’s the content itself, and its relation to other elements, that defines it. The final element we’ll discuss in this chapter is the footer element. As with header, you can have multiple footer elements on a single page, and you should use footer instead of something generic such as <div id="footer">. A footer element, according to the spec, represents a footer for the section of content that is its nearest ancestor. The section of content could be the entire document, or it could be a section, article, or aside element. Often a footer will contain copyright information, lists of related links, author information, and similar information that you normally think of as coming at the end of a block of content; however, much like aside and header, a footer element is not defined in terms of its position on the page, so it does not have to appear at the end of a section, or at the bottom of a page. Most likely it will, but this is not required. For example, information about the author of a blog post might be displayed above the post instead of below it, and will still be considered footer information. Note: How did we get here? 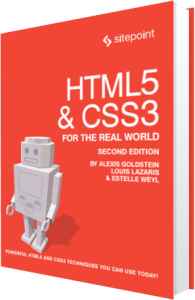 If you’re wondering a little bit about the path to HTML5 and how we ended up with the tags that we did, you might want to check out Luke Stevens’ book called The Truth about HTML5. Currently in its 2nd edition, Luke’s book is somewhat controversial. In addition to covering many of the HTML5 technologies such as video and canvas, he also goes in-depth in his coverage of the history of HTML5, explaining some of the semantic and accessibility problems inherent in the new elements and providing some recommendations on how to handle these issues.